Katrina is a 2nd year Media, Communications and Sociology student. Before coming to City she was studying at Woldingham School, a UK boarding school. Why did you apply to study at City, University of London? I loved it’s welcoming atmosphere and the staff were really helpful. There was also not any other London universities that offered this combined course. 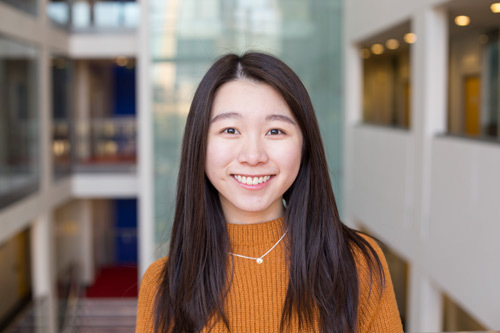 I am a Senior Marketing Student Ambassador where I lead weekly campus tours and lead teams working at University Open Events such as Open Days and Open Evenings. I am also a Widening Participation Student Ambassador where I facilitate on campus events involving children ranging from year 6 to sixth form. I am the Deputy Communication Officer of the Chinese Society where I take charge of the communication between the society and City’s Students Union. I'm interested in working in advertising so will either look out for internship programmes, or will consider studying for a master's degree. Be yourself, be authentic and true to yourself and ask whether you’d like to be in a diverse environment.